​Goodreads reading challenge…and a question! Have you set a goal this year? This year I set my goal to 110 books. I wanted this year to be about quality not quantity! I look at some of my friends challenges and they have set over 300 plus. It got me wondering, how do people read that many books in a year? Now I love reading, I love books, I love a great story, but for me 300 is totally unrealistic. I only read on an evening and unless it’s a short book, I never read a book in 1 night. Even if i was home and not at work I’m not sure I could devote the time to read every day. What about housework, washing, shopping etc. If I had a book that I was obssesed with then I would totally take a day out to read it, but everyday? I’m not disputing that they read that much but how do they do it? Do you do read over 200 books in a year? Tell me your schedule and your secrets! I could never read over 200! I would absolutely love to, but life gets in the way. I know…I would be living in a dirty house eating takeaway on paper plates everyday! Mind you I would love to be able to read that amount in a year! Yes, I agree with you. Reading 300 plus books per year is unrealistic. Unless they are reading comics or erotica. There are average 80 pages in such books. I have read 40 books since january. 10 were comics and 30 books were YA and thriller. My goal is to read 45 books this year. Initially I set my goal to read 40 books this year. When I was about to finish the challenge I added 5 more books to read. 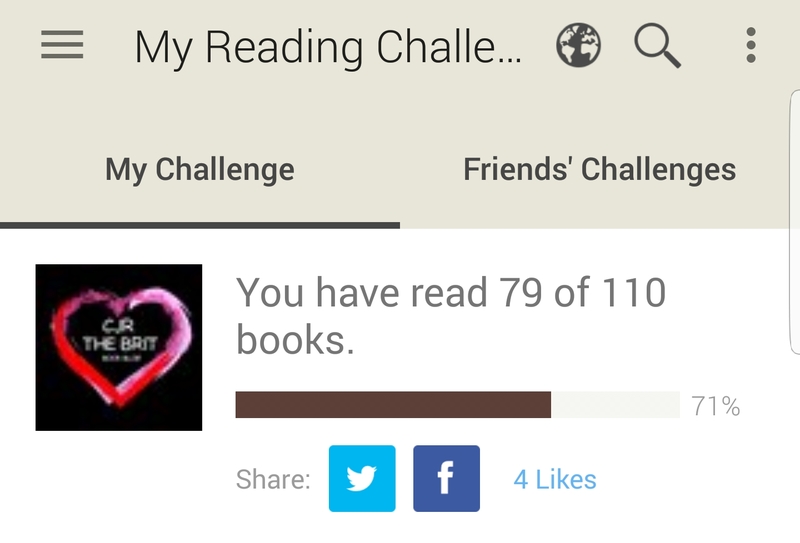 My goal is set to 100 and according to Goodreads I’m 10 books behind. I think people who can read 200+ books a year either don’t have a job or it is their job, haha. I wish I could read that much but I just don’t have time. Nor me….but I would love to! Personally, I work over 50 hours most weeks and live alone. So after all the house work and my gym sessions I don’t get a huge amount of time to read. I am also not a speed reader. So my target of 50 books is about right for me. I also do not count audio books as a book read on good reads. Purely because it’s kind of cheating. The narration and production plays a massive role in the enjoyment, something that can’t really be put in a goodreads review. Maybe these people with 300 books are speed readers? Or perhaps they read a lot of short stories (I have reviewed a few and they do count towards your total) or maybe they count audio books as well. Other than I can only assume they use witch craft. I often think the same as you. Saw one person with over 300 as a target. Madness. I just would never get the time! 300?!?! Nope, I’ll stick with the 50-100 range. Whenever I’m bored, I read. Read more before I go to bed to help tire myself out, too. Some people say to take a book wherever you go, so that can also be a way. Just have to fit reading into your daily activities, ya know? I only started the Goodreads Challenge in earnest in 2015. This year, I’m 30 books away from my goal of 250. Like Book Twins Reviews says, it’s possible to read hundreds of books per year. I don’t watch TV much, and I read very quickly; I can read a paperback of 500 pages in one day. Though I play FB games, I play them at night. During the day, I always keep my phone charged, so I can read anywhere. I was recently unemployed, so I was able to read quite a few books. I have 29 as my challenge 😀 this bothered me for a second once I realized how much other people read, but honestly is the best I can do while still putting up with a full time job, family, friends, travelling and other hobbies. I often read a few pages and spend a few minutes considering what I read, searching for meaning or simply absorbing the book. I am a slow reader and that’s fine. You’re doing great! We nominated you for the book blogger test!